Be warned - things are getting tough now. But you can still put an end to it and simply switch on your tv. There you might e.g. encounter a nice, thoroughly sadistic casting show. Or a blood-flooded criminal story which will keep you awake until the other drugs are becoming active and will cause you to fall asleep on your sofa. The remainers are cordially invited to follow our short lectures in DIY and build their own Raman microscope spectrometers from scratch. Agreed, the Enuro microscope looks like a toy when compared with the Optiphot and its height of about 70 cm. But there is no doubt that even the Enuro would be perfectly able to visually demonstrate all the findings by Robert Koch and other famous scientists. Besides it was not cheap at the time when it was produced. Translated to nowadays its sale price would be ca. 1,200 US $. Fig. 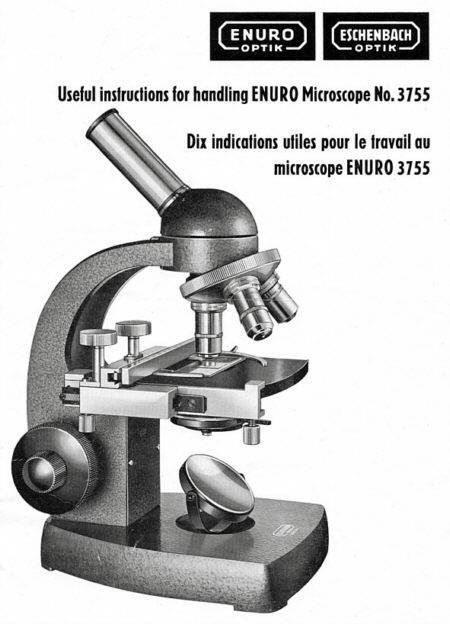 2: Title page of the French manual for an Enuro 3755 microscope. The two logos are well able to document two production lines of the same company (Eschenbach, Nünberg, Germany) which had a cheaper sideline called "Enuro" (Enuro = Eschenbach Nuremberg Optics). And yes, our global world is bizarre. You might come across this type of intrument on Ebay in a price region below 50 US $ today. And there is no doubt that these instruments are much better than many toy microscopes in the same prince range. The 45° tube of the Enuro can be taken off and replaced by a straight tube which might serve as a basis for a simple Raman transmitted laser light setup. 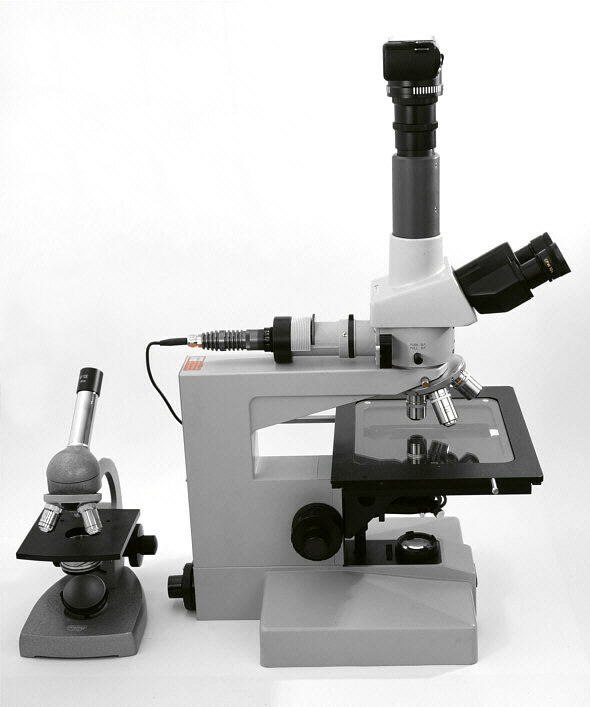 The Nikon Optiphot is a bigger "universal" microscope, clearly designed for professional purposes. Its huge object table was used for chip wafer inspection in 1986. 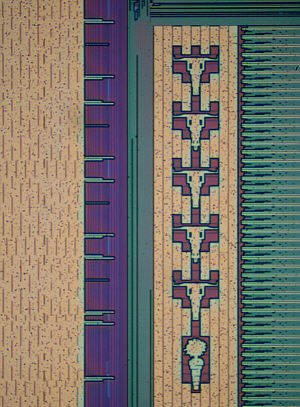 Today this is no more possible - as the electronice curcuit dimensions on the chips are too small to be controlled by means of a light microscope. Fig. 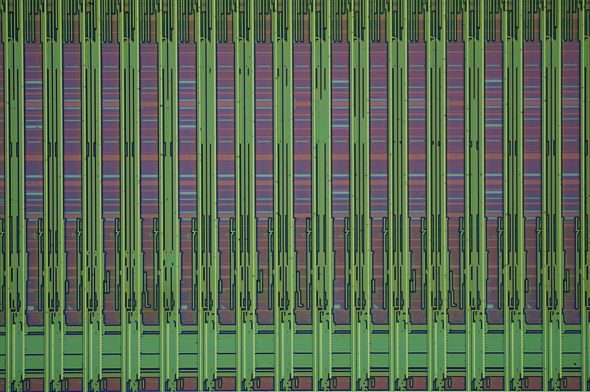 3: Detail of a AMD 486 DX2-66 CPU, photographed by means of the Optiphot microscope. Image width ca. one millimeter. Incident light from above. Objektive Nikon M Plan 10x/N.A. 0.25. Fig. 4: Other detail of the same old AMD CPU, taken by means of the Optiphot. Same optical configuration as in fig. 3. But frankly speaking we do not know what kind of message might be hidden behind those three buffallo skulls and the (?) carrot? The Nikon Optiphot can be found as a second hand bargain from time to time. We received ours from the U.K. The seller even provided a modern LED illumination which can be used for incident and transmitted light. The price of this instrument was well below 1,000 US $ and we love it due to its sturdiness, mechanical precision and image quality. Fig. 5 - the bizarre pathways of the light in an incident light microscope: The LED light (1) is entering by the cylindrical tube of the so-called opaque illuminator. It passes a first inner iris, then a matte filter (which is almost transparent) and a second iris (the aperture iris). Then it is directed downwards by a semi-transparent mirror, through the objective, on the object stage (2). The object on the stage is reflecting the light back into the objective, partially towards the eye-pieces (3) and partially towards the camera (4). So the objectice is serving at the same time as a condenser and as an image forming optical element. The small Enuro microscope is well suited for a casual demonstration of the Raman effect in transmitted light. The laser can be mounted under the object table and the spectrometer on top. So there is no danger of any eye-contact with the laser in use. But due to the lightweight of the Enuro your experiment will be of a temporary nature only and it might be difficult to perform the necessary step-wise precision justage and optimization. 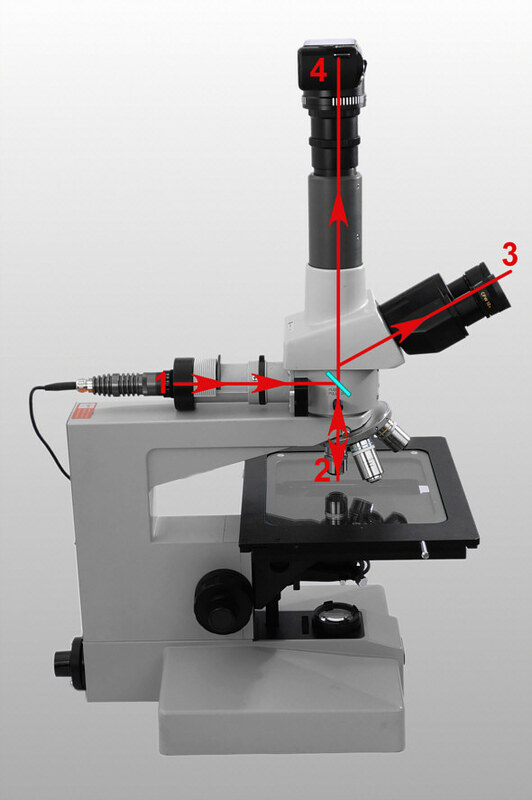 In the next issue we will begin to describe how we converted the Optiphot into a simple Raman spectrometer microscope. © Text, images and video clips by Martin Mach (webmaster@baertierchen.de). The Water Bear web base is a licensed and revised version of the German language monthly magazine Bärtierchen-Journal . Style and grammar amendments by native speakers are warmly welcomed.